BenQ America Corp. announced a new lineup of digital signage products. Designed to deliver content in any environment, the company's new products have features such as six-point touch interactivity, 4K resolution, dual-sided viewing, and varying sizes and formats to satisfy settings ranging from classrooms and boardrooms to retail, hospitality, and public transportation. The new additions further complement BenQ's existing IL and P Series. The RP Series focuses on multitouch technology for more engaging content delivery. Featuring 4K resolution, BenQ's 84-inch RP840G flat panel provides six interactive touch points, multi-PC touch control via USB, and EZCast software for sharing content from any PC or WiFi-enabled smart device. Equipped with the DisplayNote teaching software bundle, the solution is suited for education and business situations requiring participant collaboration via laptops or tablet devices. 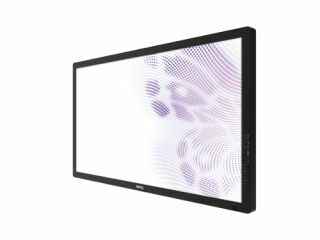 BenQ's new 70-inch RP700+ interactive flat panel has multitouch technology for responsive feedback and accurate positioning to augment interactivity in any of today's signage applications. As a result, students, presenters, and information-seekers can simply touch the screen for ultra-responsive panning, zooming, and scrolling, just like a tablet. BenQ's RP551+ flat panel also provides six on-screen touch points. The RP551+ uses ambient light adjustment technology to protect eyes and reduce power consumption by up to 50 percent. Providing an average of 50,000 hours of use, the panel provides long-lasting performance that reduces maintenance costs and total cost of ownership dramatically. BenQ's entire line of RP panels features advanced anti-glare and anti-image retention. The displays support a low blue light mode for further visual protection, while increasing system-wide convenience via multiplatform support for Windows, Mac, Linux, and Chrome OS, in addition to convenient connectivity capabilities via front panel input/output options. BenQ also has a new slim DL550F (panel only) and DH550AC (panel with stand) displays offer full HD (1920x1080p) content in an ultra-slim 55-inch dual-sided panel design for retail stores, transportation areas, and other public venues. Bringing users information-access from both sides of the panel, the displays are one-inch thick and light enough to hang from ceilings or be used on its stand. Furthermore, the DH550AC has no required construction and can fit into tight spaces due to its slim build. The unit can show different content streams on either side and features multiple brightness levels to complement any ambient environment. BenQ's new bar-type 16:3 format displays enable ultra-wide signage in either 28 inches (BH280) or 38 inches (BH380), for public transit, restaurant menu boards, and more. Featuring 700 nits and 800 nits of high brightness respectively, the BH280 and BH380 offer 178/178-degree viewing angles, DVI and VGA signal interfaces with included DVI to HDMI adapter, and portrait and landscape configurations. Both units are VESA mountable for easy installation and integration with existing systems while LED backlighting provides the industrial-grade panels with a lamp life of up to 50,000 hours. "Our latest digital signage solutions affirm BenQ's focus on making classrooms and boardrooms more collaborative spaces," said Bob Wudeck, Associate Vice President, Strategy and Business Development at BenQ America Corp. "BenQ is enabling smarter, more impactful digital signage installations across all applications."